Tonight Princess went to be with a new owner. She is going to a really good home so that makes it a little easier, but of course Michael and I still cried a little. Her new owner is a really nice lady and she has another cat so hopefully her cat and Princess will become good friends in no time. She said they were going to stop at the store and buy a bunch of new "Princess" stuff for her so I know she's going to be spoiled. In the morning Owen and I go downstairs to have breakfast shortly after he wakes up. I've always been one of those people that wakes up starving...I have to eat and NOW!!! When we would get downstairs I would have to put Owen down so I could make breakfast and every morning he would just have a royal fit when I put him down. It made making breakfast so hard! A few days ago I decided to first get him a sippy cup with milk and then sit and snuggle him for a few minutes in the playroom. Owen doesn't really let me snuggle him much because he's just everywhere, but in the morning he will. Sometimes it can be for a long time and like this morning it was only for a minute, but now he doesn't fuss when I make breakfast. Plus I LOVE my snuggle time with him. It's so nice to hold him close and run my fingers through his hair and kiss his head. After much thought and going back and forth we have decided to find new homes for our cats. It was fine when Owen was little and couldn't get into the cat food or litter, but now that he's older he's into everything. We have sectioned off one of the bathrooms as the "litter room", but it's the bathroom that will eventually need to be Owen & Jack's bathroom. Owen loves the cats, but Princess is the only one that really likes him. Punkin runs from him every time. Precious will put up with him sometimes, but other times I won't see Precious ALL DAY. I feel like they are totally getting neglected and that's just not fair. I want them to feel free to to roam around their house and play and get attention. With one kid they hardly get any attention so I can only imagine what it's going to be like when Jack gets here. Plus they really are dirtier than Owen is. I'm tired of all the hair, litter and cat puke on everything. So on that note...if you know of anyone who would like to have a cat please send them my way. I have already posted them on Craigslist and someone is coming to look at them tonight, but she can only take one so there are two more available. Michael worked most of Saturday on the fence and he finished it. All he has to do now is one small section on the side of the house so Owen won't go tumbling down this drop off. Thankfully he doesn't really pay attention to that side of the house much. He also needs to stain it, but other than that it's finished. It was really nice to sit down and not have to worry about running after Owen. Check out my new haircut! I love how the gate has that crossbeam. It kind of look like a barn door. So cute!!! On Saturday morning Owen managed to leak through one of his overnight diapers, but instead of putting him in another sleeper I decided to just have him run around in a diaper and Uncle Ryan's bathrobe. I can't figure out if he looks more like a mini Hugh Hefner or a karate student, but he sure looks cute! Also check out the new haircut. We buzzed his hair just like Daddy's the night before. At first I thought it was way too short, but now it's starting to grow on me. I know that was lame! So yesterday at my doctor's appointment I found out I'm one centimeter dilated. WOO HOO!! It's not really anything to get too excited about though. I remember one of my co-workers was 3 centimeters dilated for the last month of her pregnancy. The doctor said that Jack is probably about 7 lbs right now so if he ends up being full term he'll be an 8 lb baby. That's sounds nice to me! Yesterday morning I was thinking about how much I've been wanting Jack to come and then it hit me...these are the last few days it's just going to be Owen and me. I really need to just stop and enjoy these moments because I will never again have only 1 child. Owen has had my attention all to himself for 16 months, but soon he will have to share me. Jack will never know what's it's like to have Mommy all to himself, but since Owen does I don't want to rush this time in his life. It was a hot one! On Saturday Owen and I decided to head down to Ga-Ga & Pa's house since Daddy was going to be working in the yard all day. Plus Ga-Ga & Pa had air conditioning installed at their house a few weeks back so it was going to be way more comfortable down there than at our house. It ended up getting to 97 degrees in Orting so the air conditioning definitely came in handy! This is Owen's first time "running" through the sprinkler. The water was freezing. I could only keep my feet in it for a few seconds, but he just stood there forever. Owen loves to climb up the steps to the sliding glass door, but then he doesn't want to come down because of the cement so this him asking Ga-Ga for help. Owen thinks Ga-Ga is so goofy wearing his sunhat!!! Here's what I look down and see everyday! BTW those are my new flip flops I talked about in the previous post. They are from Old Navy and they are super cute...plus they only cost $5!!! Today was so nice! It wasn't nearly as hot as they said it was going to be, but that's okay with me. I'm packin' around 30+ extra pounds so 65 to me feels like a heat wave. This afternoon I decided to take Owen down to the Redondo Beach and let him have a little fun in the sand. First we were going to take a walk and then I was going to sit on the beach with him. The walk quickly got cut out of our plans when my new flip flops started hurting my feet almost immediately. So we headed right for the sand. At first Owen wouldn't even let go of me, but after a while he did start to walk around and enjoy himself. See his cute little footprint in the sand!!!! I tried to get a cute picture of him sitting on the driftwood, but the moment I let go of him he started crying. He always puts his hand to his mouth like this when he cries really hard. Shortly after this picture I got sand in my camera and now it's broken. I'm just sick about it. It has a warrenty so I'm sending it to the repair shop tomorrow, but still I've only had it a couple of months. I bought it specifically with Jack's birth in mind. My old camera was so awful I just knew it wasn't going to cut it anymore and I want really nice pictures of when Jack is born. Luckily I've already talked to my mom and she is going to let me borrow her camera until they have fixed mine. This morning I decided to let Owen try and feed himself with his new Spiderman spoon. He's been more and more interested in using utensils, but I haven't let him because I have to get over the mess factor. He actually did really well though. He ate about half the yogurt and only got frustrated a couple of times. Even though the second picture looks bad he wasn't as messy as he could have been so that was nice. A while back I got Owen an outfit that said Little Monkey on it and I also got him this sunhat. It's a little big, but I'm hoping it will fit him through the whole summer! He was so excited to be outside he didn't keep trying to take it off either. YAHOO! The other morning it was so warm in the house that after I changed Owen's diaper I decided to just let him run around without any clothes on. He thinks this is the greatest thing! I had such a nice time on Mother's Day just hanging out with Michael and Owen. Michael has been working some weird hours and doing a lot of extra work at home in the yard so he wasn't feeling too well. So we decided to sleep in and not go to church. Michael made me a great breakfast and he also made a card for me on the computer. After getting ready we decided to take Owen to this park in Kent that we drove by once. It was lots of fun..windy and cold, but fun! After leaving the park we went to IKEA so I could buy picture frames for the professional photos we had taken in April. We decided to eat lunch at the IKEA marketplace. I have never had their Swedish Meatballs so we shared those. Owen loved them! I think he ate 3 whole meatballs!!! After Owen had his nap and we ate dinner, Michael moved Owen's car seat from backward facing to forward facing. Since he's over 20lbs he can sit like we do now. He also installed Jack's infant car seat in the van so we'll be prepared. When we left for the hospital to have Owen we didn't have the car seat installed so we are ahead of the game this time around. Owen really enjoyed being able to see out the front window and being able to see us. He was so vocal on the ride to Wal-Mart! Michael and I are so spoiled when it comes to sleep right now. Owen is such a good sleeper and really always has been. In fact we sleep more now than we did before having kids. Right now Owen goes to bed at 8:00 and usually gets up around 8:00 or 8:30 the next morning. He also takes an hour and a half nap right after lunch. We really are lucky! That is all about to change though. Once Jack gets here we will have to start all over again with the newborn sleep schedule. Hopefully it won't take Jack long to get the hang of sleeping through the night. Owen slept through the night for the first time at 9 weeks old. Jack already has a pretty good schedule. He is most active during the day when I'm up and moving around and then at night he just gets comfy and goes to sleep. I never get woke up in the middle of the night from him moving around like I did with Owen. Owen has finally mastered his sippy cup. YAHOO! He is only getting one bottle a day now and that's right before bed. During the day he either gets - milk, water or half water/half juice in his sippy cup. For the longest time we would have to help him drink from his sippy because he just didn't understand that he could lift his arms up and tilt his head. I finally got tired of holding his cup and about a week ago he figured it out. Now he's really good about it except when he tries to drink and walk at the same time...that gets ugly! Last Sunday afternoon my mom through me and Jack a baby shower. It was down at her new house in Orting. Jack got lots of cute clothes and some essentials that we needed. We really don't need that much stuff since we saved everything that Owen used. In fact most of the items I registered for were big boy things that Owen would use first and then Jack later on. It was just great fun to hang out with friends and family. My cousin Tara got this airplane for Owen. It's so cute. It's soft and squishy and it has three buttons you can push to make it work. One button sings a song, the other one is like someone talking over the radio and the third just makes airplane noises, but all of them make the propeller spin round and round. Too cute!!! This is my friend Kim, our pregnancies are only separated by 18 days! I'm due on June 9th and she's due on June 27th. Nice timing, huh?? She is having a boy as well so hopefully Jack and Andy will be good buddies when they grow up. This is my secret weapon when I really want Owen to eat a good breakfast. Good meaning a lot of food not good meaning healthy! So I had another doctor's appointment today and I let my doctor know that she can take Jack out anytime she wants. Of course she just laughed. I'm sure she hears this from a lot of pregnant women who - can't move, can't breath, can't sleep, can't fit into anything and just all together feel totally uncomfortable. Of course I'm trying to have a natural birth this time around instead of a C-section so we will just have to wait for Jack to be ready to come out. I know there are a bunch of home remedies that I could try to naturally induce labor and I might seriously start considering those this time next week. Let's just hope and pray that Jack wants to come out just as bad as I want him to. Michael is always trying to take funny pictures of Owen. I remember when I went to Gene Juarez last year for a massage while I was gone he took pictures of Owen with his stuffed hippo on his head. This is his latest try at being artistic when it comes to photography! It kind of makes me dizzy looking at this picture, but Owen sure has a cute smile! Today we went to Winco to get some groceries and when I was standing in the checkout line I noticed all these cute summer outside toys. There was buckets and scoops for playing the sand, a wheelbarrow and a lawnmower. I took the wheelbarrow and the lawnmower over to Owen and let him pick which one. I don't think he even gave the wheelbarrow a second glace! It was love at first sight for sure!!! When we got home we set it down and he played with it all by himself for about 10 minutes. He must have made 3 or 4 laps around the first floor of the house. Last Saturday Michael borrowed his Dad's truck so we could go to Carpinito's Brothers and pick up a yard of gravel. Grandma & Grandpa Martin watched Owen so Michael and I could go together. It was almost like a little date getting to go somewhere with just my husband. I know that sounds weird, but it was really fun! Let me tell you a yard of gravel is a LOT of gravel! It only took the guy at Carpinito's Brothers one scoop from his big truck, but it took Michael 25 minutes to shovel it out of the truck. 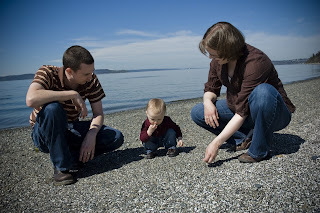 After Michael finished getting the gravel out of the truck I went and picked Owen up from Grandma & Grandpa's house. He had just fallen asleep in Grandpa's lap and he was so cute. I should have taken a picture, but it didn't cross my mind at the time. Silly me! Later on after lunch we took Owen out so he could see the big rock pile and he was so cute. There were some rocks that didn't quite make it on the tarp and he was picking them up and throwing them on the tarp where they should go. He's such a good cleaner upper! These last two pictures are from Monday night when Michael was working out in the yard. I had just gotten Owen's shoes on and we were ready to go outside and I opened the door and it was pouring down rain. By then Owen was all excited to go outside so there was no denying him so I let him go out in the rain. We had been out there a few minutes when I remembered that Ga-Ga bought him this super cute raincoat. It's still a little big, but it did the trick and the amazing thing is he kept his hood up the whole time!!! In April we had professional pictures taken down at the Redondo waterfront and also at the house. 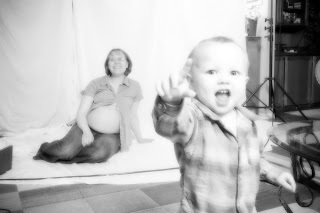 I wanted to have belly pictures take with Jack since we did that with Owen. They turned out so great I bought a CD and the copyrights to the pictures. Enjoy!